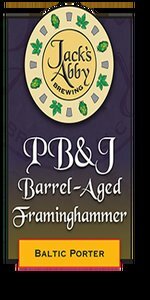 Framinghammer Baltic Porter aged in bourbon barrel with peanut butter and raspberries. Bottled 3/13/207. 16.9oz bottled poured into tulip. Just about black pour, no light comes thru. Almost a finger of cappuccino colored head. Taste leaves a lot to be desired. Peanuts, chocolate and vanilla and an overpowering amount of tart raspberries. I don’t get a whole lot of bourbon or booze for that matter. The body needs to be bigger, the carbonation to be less as well. This beer is a bit of a disappointment to me, I’ve hyped myself up for it. Maybe it’s bigger and better fresh. I received in a BIF around October, at this point it’s 10 months old. I’d be willing to give it another go with a fresher bottle. S- Chocolate, some mildly tart raspberries, bourbon, roasted peanuts. T- Chocolate, roasted malts, raspberries, roasted peanuts, some bourbon. M- Smooth, medium to full body. O- Love the raspberries in this, they are nicely balanced with the porter. Definitely something I would pick up again given the chance! Poured from a 16.9oz bottle (B.O.D 13 March 2017) into an 10oz Libbey snifter glass. Aroma certainly features some roasted peanut & traces of raspberry to compliment the dark malt and bourbon. Taste is more heavy / bourbony, but the peanut butter is there & works well with the vanilla / caramel of the bourbon though the fruit addition gets lost. Good desert beer.